Last week Yahoo Movies published a few cool infographics comparing the most famous slasher movie villains: Michael Myers, Jason Voorhees, and Freddy Krueger. Jason has “appeared” in thirteen films, Freddy was featured in nine films, and there were ten Halloween movies in total. So which one of these killers has the biggest bodycount? And which one of these horror franchises made the most at the box office? Hit the jump to find out. Head to Yahoo Movies to see the image in full resolution. 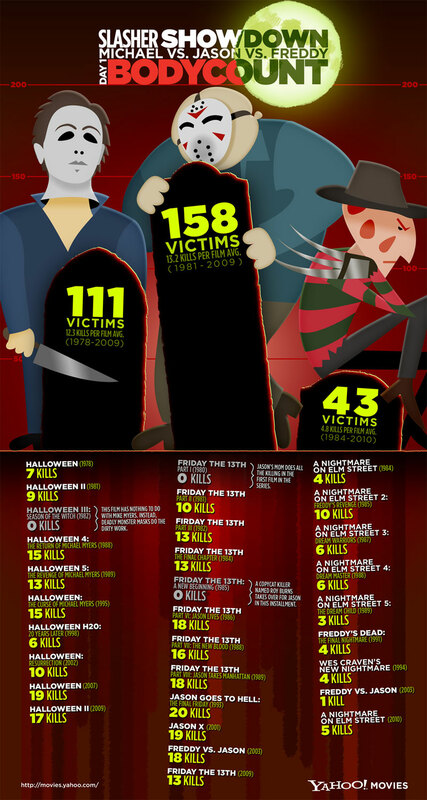 Head to Yahoo Movies to see the image in full resolution, or to see more infographics from their slasher movie showdown series.